Bob Challman was one of the group of unique characters in the early story of the Lotus Car Company. Bob was definitely one of a kind, and he played a major role in building the brand in the United States through the sale of cars from his dealership in Manhatten Beach, California. He was the western US distributor of Lotus cars via his company he named Ecurie Shirlee Corporation. Shirlee was Bob's first wife who been killed, along with his children, in a car accident while they were on the way to Santa Barbara to watch him race. By the time I met him had survived this tragedy as well as a major financial blow as a result of some of Colin Chapman's ruthless business dealings. Bob still had a passion for automobiles and sought to produce a sports car which incorporated some of the lessons he had learned with Lotus and avoid some of the pitfalls. Bob's great concept was to develop a high performance chassis over which a production car passenger compartment would be used. The point of this was to overcome the difficulties of developing doors and windows with the associated cost, operation, sealing, etc problems. Bob had faced many of these kind of problems with the Lotus cars. Crash safety was also important to Bob's specification. 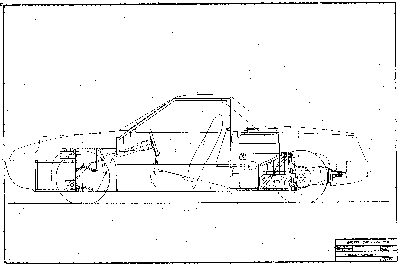 I was commissioned to layout the car and design the chassis. The car was based on the Ford Pinto, and I used the engine with a VW transaxle and rear suspension to achieve a mid-engine layout. I designed the front suspension around the Ford spindles, brakes and rack and pinion. I designed the chassis as a semi-monoque formed from sheet aluminum and with a steel tube structure at the rear. 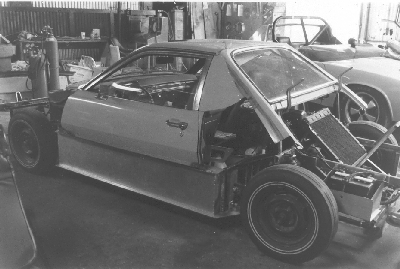 Bob was able to get the chassis built and a rolling chassis partially assembled before his financial difficulties brought the project to a standstill. 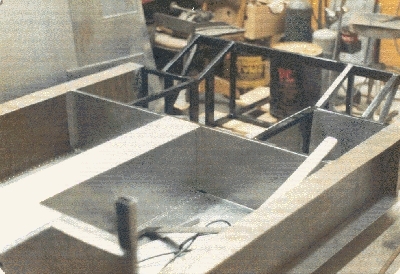 Here is the chassis under construction. A tubular steel section was part of the semi-monoque at the rear. I designed the front suspension geometry around the Ford front spindles and rack and pinion. 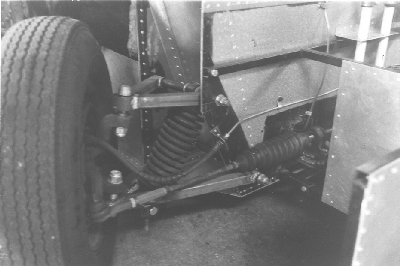 The suspension arms were fabricated from steel tubing. This is the rolling chassis with the Pinto section in place. Here's one of the layout/conept drawings.